FINN Bryant could not wipe the smile off his face when he was the first person to cross the finish line at the Mother's Day Classic. He's a self-confessed fitness fanatic, who loves hockey and surf lifesaving. He started the run with his mum, dad and sister, but soon raced off out the front. It was his second time in the fun run, and he expects he will be back for next year, since he does not live far from the beach. "We moved to Tannum from Miriam Vale last weekend and we're not far from the beach," he said. "It was just easier to get to all of the sports we play." 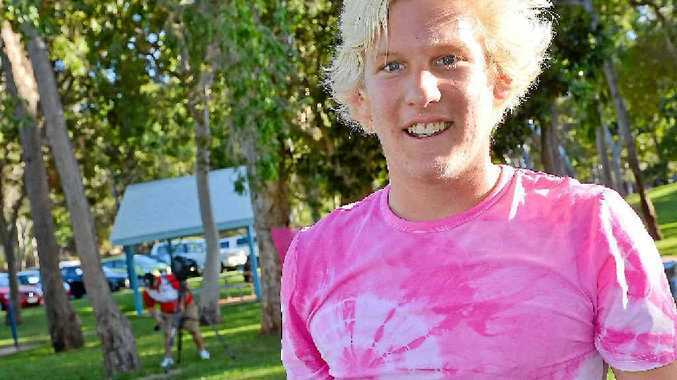 The Miriam Vale High School student said he tried to get to the beach most mornings for a swim. "It's great living here, I can just walk down in the morning for a paddle." Finn will go to Tannum Sands State High School next year, but he already has a rough idea of what he wants to do after he graduates. "I'd love to do anything to do with sport. I've done work experience at Powerhouse gym before and so they taught me heaps about personal training," he said. This year he wants to complete his certificate three and four in fitness.